Get your childhood on the phone, and tell them that in roughly 15-20-ish years, all their favorite things are going to come back, and come back in a BIG way. Disney XD is getting ready to launch their DuckTales reboot, based loosely off of the OG series and the long-running DuckTales comics, and it’s a great time to be a late-80’s, early 90’s kid. For those who great up watching the Disney Channel afternoon block of shows, this is almost as good as licking the frosting out of a Dunkaroos packet. I have been eagerly awaiting 2017’s take on Huey, Dewey, Louie, and Uncle Scrooge, which means that I’ve been watching – and rewatching and and again — the trailers for the new series. 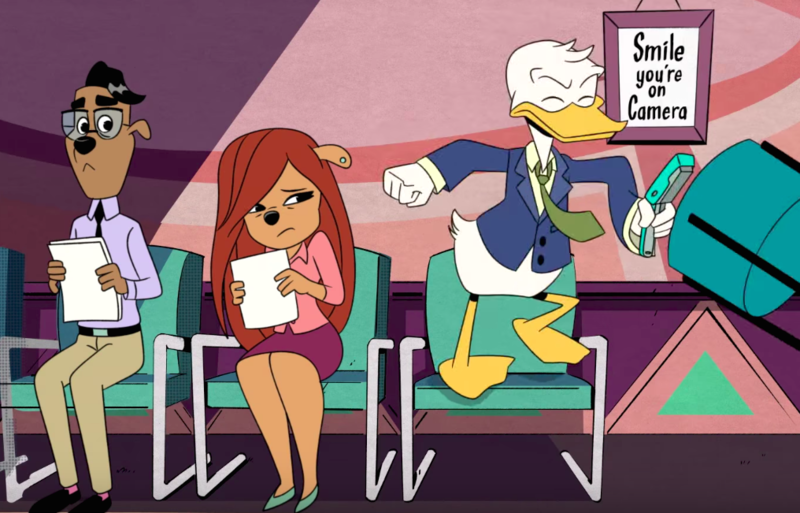 One of the latest ones featured Donald Duck sitting in a waiting office, next to a character who looked vaguely familiar. Not familiar to the world of DuckTaleles, but familiar to the world of Goofy. Sure looks like Roxanne from A Goofy Movie, right? Sure does. And since I, like the rest of the internet, live for Easter eggs and extended universes, I need to know if the new DuckTales really takes place in the world of Goof Troop. When you’ve got a question that big, you go right to the top: The DuckTales creative team, executive producer Matt Youngberg and co-producer/story editor Francisco Angones. While not exactly confirming that yes, these two Disney afternoon shows take place in the same world, the shared universe was basically confirmed — via a Powerline joke. "I once pitched [for DuckTales] that Dewey would have a Powerline poster on his wall," Angones explained at Disney's D23 Expo last month. "Because Dewey [the blue duck], being the middle child of the triplets by three seconds, is always looking for a way to stand out among the crowd. Even if he has to shout out loud." Don’t go looking for Powerline in any episode, as it’s not there — but that doesn’t mean that he, Max, or Goofy couldn’t show up later. It’s already been confirmed that Darkwing Duck, aka the terror that flaps in the night, is coming to DuckTales. We’re like one cameo away from a full-fledged Disney Afternoon Extended Universe, and omg, please let the Rescue Rangers pop in. "[Powerline and Darkwing Duck are] the history of Disney, and it's not just the history of Disney, it's also the history of the Disney afternoon, which was huge to our [show]," Angones continues. "So we always try to be respectful when we're talking about any Easter eggs, hints, illusions." While we might not have the nephews rocking out to “I 2 I” anytime soon, you can catch all their hijinks when the DuckTales kickoff movie, “Woo-oo!” premieres August 12 ALL DAY on Disney XD, and when new episodes premiere on September 23rd.